An exoskeleton protects both the body of a person, and allows them to carry heavier loads while assisting with things like walking, running, and other muscular movements. The Defense Advanced Research Projects Agency (DARPA) is already building exoskeletons for soldiers in the field, while NASA is testing exoskeletons that help astronauts exercise in space. And now, a student at Monash University in Melbourne, Australia, decided that firefighters could also benefit from this technology and has designed an exoskeleton concept that will assist them in saving lives. Firefighters are usually weighed down with a lot of vital gear when they go into a flaming building, nearly 50 pounds worth of equipment. In emergencies, that weight might be as much as 125 pounds. Besides the gear, firefighters have to run up flights of stairs and carry people in rescue missions. All of this puts a lot of stress on their bodies and limits their performance, meaning that fewer people get rescued. But the firefighting exoskeleton fits over their gear, and allows the fireman to carry up to 200 pounds. 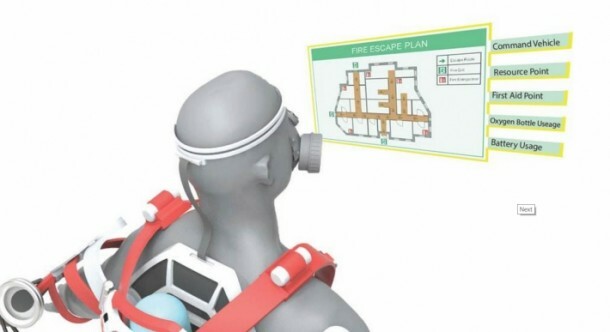 It also supports muscle movement, making it easier to run up 20 flights of stairs, and speeding up the rescue process, letting firefighters save more lives. In case a firefighter needs to lose the exoskeleton quickly, a press of a button releases its joints and it falls apart. Unfortunately there is no prototype of this exoskeleton yet. It’s based on technology similar to that used by the U.S. Army. The exoskeleton weighs 50 pounds, but it’s designed to considerably lighten a firefighter’s load. A suit that allows more lives to be saved. The only problem now is when can it be made a reality?